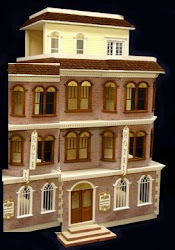 This particular blog is about my "Victorian Mansion" - a creation that has been in the making for over 17 years and is just being assembled in the fall/winter of 2010. I had always wanted to create a Mansion in miniature (probably my parent's fault for taking me to see Colleen Moore's Fairy Castle in Chicago when I was a child). I started collecting pieces for this dollhouse as a teenager - even envisioned the dollhouse's "set scene" would be a Victorian family preparing for a wedding as I myself was preparing for my own wedding. During a childhood visit to the Biltmore mansion in NC, I fell in love with the two-story library with spiral staircase. And numerous viewings of the movie "The Sound of Music" firmly planted the idea of a formal full ballroom with chandeliers. A trip to see the Newport Mansions inspired me to want a separate his/her bedroom(s) and bath(s), music room, parlor, grand staircase, etc. But no dollhouse kit had these features . . . .